Depending on your vantage point and how long you’ve participated in the deep-sea mining community, this will either come as a huge surprise or be completely unexceptional. Prior to the formation of the International Seabed Authority, there were no international rules governing the extraction of seafloor resources from the high seas. Multiple nations as well as private companies were engaged in exploration to assess the economic viability of extracting polymetallic nodules and tons of material was recovery from the seafloor for research and analysis. Some of that material almost certainly passed into private hands. Congratulations to Dr. Hal Holmes of Conservation X Labs for earning a Moore Foundation Inventor Fellowship for his DNA Barcode Project. Reef RangerBot becomes ‘LarvalBot’ to spread coral babies. Turn of the tide: Seeing dolphins differently by National Aquarium Director John Racanelli. It’s been almost exactly a year since I selected the 5 best baby books to launch your child’s ocean education. Since then, our expert judge has gotten a bit more discerning and a lot more opinionated. As a family of marine scientists, our massive library of ocean-themed children’s books, some amazing, some not-so-amazing, seems to grow exponentially. After critical review by two PhDs in Marine Science and Conservation and one very perspicacious toddler, for both scientific accuracy and pure delightfulness, here are our top 3 children’s books to get your toddler thinking about the ocean. 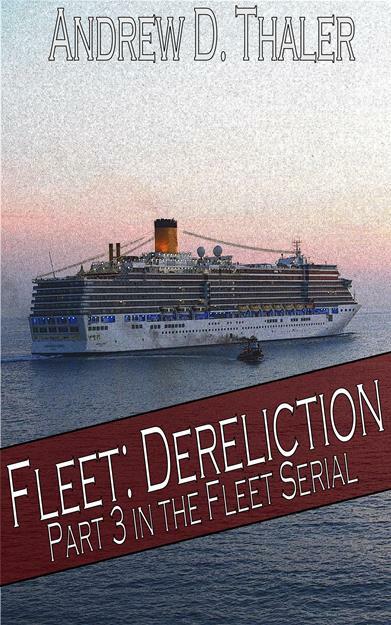 Fleet: Dereliction is now available through the Amazon Kindle store! The fleet is in chaos. Their best ship has been stolen. With her authority slipping away, the Admiral must seize command, root out the mutineers, and recover her stolen vessel. But, on the other side of the Reach, the trio – Croaker, Snapper, and Salmon – have reached their destination, the mysterious derelict that has been supplying the fleet for months. The darkest secrets in the fleet will rise to the surface. Head on over and check it out! It’s only $0.99, what have you got to lose? Fuel is the lifeblood of the fleet and it is running out. It has been months since the crew of Miss Amy brought home a catch big enough to feed the fleet. With fuel rationed, there is little hope for fresh fish. Gill works frantically to develop a renewable source of bio-diesel. Croaker is the only mariner able to keep Gallant’s engines running. Snapper is the last hope of an aging navigator. While the ships rust around him, Grouper begins the final phase of his destructive plan. Fleet is a decidedly salty vision of the near future, where an unknown plague has left land uninhabitable and sea level rise has created vast new oceans to explore. The last survivors of the human race are scattered across new and dangerous seas. The only traces of a previous world are lost among the flotsam. Check out part 2 of the Fleet adventure — Wide Open — now available in the Amazon Kindle Marketplace.